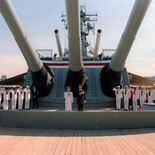 Celebrate the American Spirit on The Battleship of Presidents, Battleship Iowa. Voted one of the 'Best Cool Exhibits to See With Your Kids', and winner of the 2013 'Museum Ship of the Year'. This tour covers the gun & missile systems, officers wardroom, crews mess, and the Captain's Cabin. The Only Battleship on the West Coast Open to the Public. OBS says "Best Cool Attraction to See with your Kids"
2013 Museum Ship of the Year. 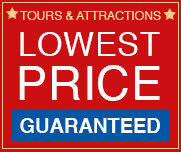 Top 20 visited attraction in Los Angeles. TripAdvisor Certificate of Excellence for Outstanding Customer Service. 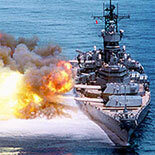 Celebrate the American Spirit at the Battleship IOWA educational museum & attraction in Los Angeles. The West Coast's only Battleship open to the public and the 2013 winner of the SSHSA museum ship of the year. Considered one of the 'Best Cool Exhibits to See with Your Kids'. Your tour takes you on a journey through World War II, the Korean War, and the Cold War to experience the life of a sailor on the lead ship of the last class of gunships. Tour covers 6 decks of adventure including living & eating areas, weaponry, navigation, museum, deck strolling and a kids scavenger hunt. 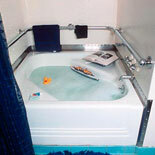 Plus see the world famous Captain's Cabin - with the only bathtub installed on a battleship for a President. Known as The 'Battleship of Presidents', IOWA has hosted three Presidents - Franklin D. Roosevelt, Ronald Reagan, and George H.W. 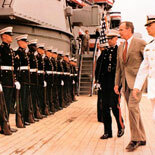 Bush - and numerous dignitaries during almost 70 years of service. Battleship IOWA is located at the L.A. Waterfront, former home to the US Navy Battleship fleet prior to World War II and an area rich in maritime history. New Exhibit- "Lost at Sea : The Explorations of Dr. Robert Ballard is now open! Ballard is known for his discovery of the final resting place of RMS Titanic; yet, many vessels that have been claimed by our oceans and seas lie undisturbed in “undersea museums” and will be revealed aboard the historic USS IOWA. The retrospective is a showcase for the museum highlighting many of the world’s historically noted underwater wrecks found by the explorer. Admission to this new exhibit is included. Battleship IOWA is a family oriented tour and what a great and fun way to learn history and actually be on a big part of that history. Don't miss this experience, get your eTickets now for a tour of the Battleship Iowa! Child Ticket: 3-11 years old. Under 3 are free. 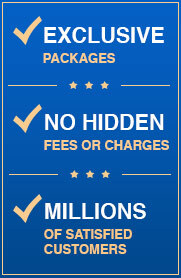 See product notes below. ACCESSIBILITY Battleship IOWA is not currently ADA accessible. There are many obstacles on the ship such as uneven decking, high door frames and many sets of stairs that are safety hazards. For that reason, no wheelchairs are allowed aboard the ship and those using canes and walkers should use extra caution. Visiting the USS IOWA can be a very rewarding family experience and children are welcomed on board! Parents must closely supervise their children at all times. Strollers are not allowed on board the IOWA. For small children, the use of a front carrier (Baby Bjorn-type carrier) is suggested. There are several stairs and obstacles on the tour. Children may not be carried up stairs unless they are in a front-facing carrier. If they are not in a carrier and cannot climb the stairs safely on their own, then the child and a guardian must remain on the main deck of the ship.